Even enough room for you and the pooch! Camping in a hammock is supposed to be the ultimate in simplicity. Pull up to a campsite, hang your hammock, enjoy camping with the knowledge you have a warm and cozy nest awaiting you when it comes time to crash. However, reality can be a bit of a different story. Especially in cooler, and even winter-type temperatures. If you’ve tried to sleep in a hammock with a sleeping bag, you’ve undoubtedly encountered two major problems. First, it’s difficult to keep the sleeping bag in place. It’s silky surface slips and slides around. If you stay in the hammock, at the least you’re uncomfortable and constantly wondering what will happen the next time you roll over. Second, laying with the bottom half of the bag between you and the hammock compresses the insulation. The result is cold spots and reduced thermal efficiency of the bag overall. 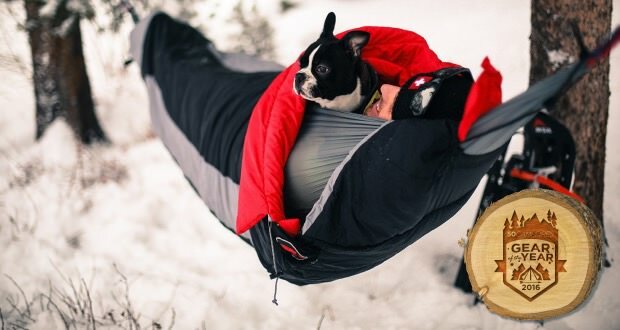 The Grand Trunk Hammock Compatible Sleeping Bag solves both problems. It wraps around you … AND THE HAMMOCK … to create a warm, swaying nest! How warm? Well the 150 gsm synthetic Eulin Fiber Fill model is rated to 32 degrees, and the 300 gsm bag is rated to 0 degrees. That’s warm enough to keep you ‘mocking through the winter … and earn 50 Campfires Gear of the Year Honors.